The middle step on the Road To Indy is to be rebranded as Indy Pro 2000 Championship presented by Cooper Tires, following Mazda’s decision to end its title sponsorship of the RTI. 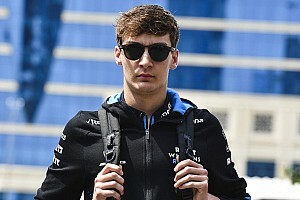 Nikita Lastochkin has joined his third Pro Mazda team in as many years as he switches to Exclusive Autosport for 2019. The Eighth Annual Chris Griffis Memorial Open Test for all three levels of the Road To Indy program takes place this coming weekend at Indianapolis Motor Speedway road course. Pabst Racing, which won the USF2000 Teams’ championship this year and last, will add Pro Mazda to its Road To Indy campaign next season. Rinus VeeKay only needed to start practice to clinch the Pro Mazda title although he was beaten by Oliver Askew and David Malukas in the races, while Kyle Kirkwood scored his 11th and 12th USF2000 wins, as Mazda signed off from its Road To Indy sponsorship. Rinus VeeKay scored his fifth straight Pro Mazda win and seventh of the season leading from the drop of the green flag to the checkered flag at the 1.25-mile oval, to edge head a Juncos Racing 1-2. 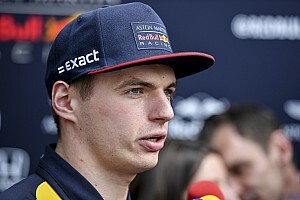 Harrison Scott of RP Motorsport has escaped relatively unscathed from a major shunt at Toronto that saw his car launched high into the air and land upside down. 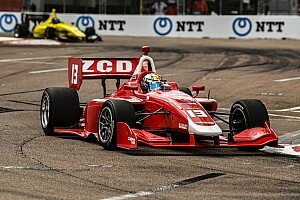 David Malukas and Toby Sowery went 1-2 for BN Racing in both Pro Mazda events, as Cape Motorsports’ Kyle Kirkwood dominated the first USF2000 race and stole the second (chaotic) race on the last lap. Former Pro Mazda driver Jeff Green has succumbed to injuries he sustained in a historic Formula 5000 race at Canadian Tire Motorsports Park. 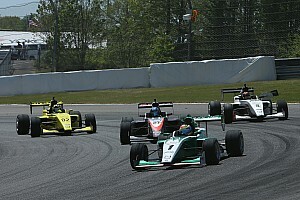 Parker Thompson and Kyle Kirkwood led the Pro Mazda and USF2000 races from pole position to checkered flag. 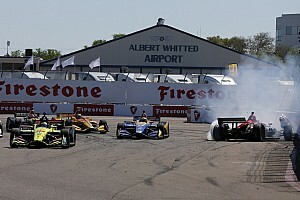 As usual, the Mazda Road To Indy’s junior series produced fantastic slipstreaming races around the IMS road course, with Pro Mazda and USF2000 producing four winners from four races. Rinus VeeKay put Juncos Racing front and center for the opening races in Pro Mazda’s new Tatuus PM-18 era, while Kyle Kirkwood and Alex Baron clinched USF2000 victories. Team Pelfrey has announced Andres Gutierrez will race its #81 Pro Mazda car in 2018, while Exclusive Autosport has signed Manuel Cabrera for its USF2000 team. Canada’s Parker Thompson will remain with Exclusive Autosport this season as the squad moves up the Mazda Road To Indy ladder. RP Motorsport, which won races in the now-defunct Formula 3.5 V8 Series and dominated the EuroFormula Open championship in 2017, is to embark on its first season of Pro Mazda with Harrison Scott and Ludovico Laurini.